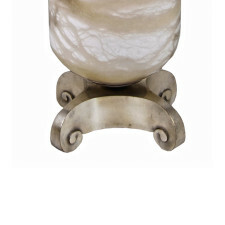 Art Deco Emile Jacque Ruhlmann Inspired Luminous Urn Light (Urne Lumineuse). Modeled after Lighting Created for the Ocean Liner Ile de France in 1927. 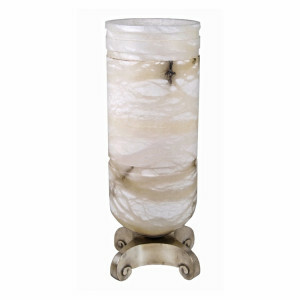 Features a Solid Lost Wax Cast Bronze Base with Scroll Design Finished in a Genuine Antique Silver. The Large Cylindrical Urn-Shaped Shade is Handmade from Spanish Alabaster and Features Relieved Circular Patterns.